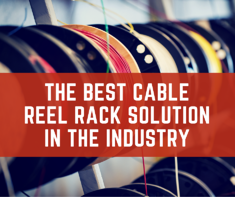 The cable reel rack is highly mobile, and can be assembled/disassembled by a single person, without any tools. The ease of use offered by this rack is unparalleled; axles can be dropped in & lifted out for quick changing of materials within seconds. If required, the strength capabilities can be expanded, allowing the rack to hold loads of greater weight. Interested in learning more about Husky Rack and Wire products?